Join us for a traditional, community brass band concert with the Woodhouse Prize Band and our special guest hosts, BBC Radio Sheffield’s Rony Robinson and Paulette Edwards. Formed in 1853, Woodhouse Prize Band have been playing brass band music in Sheffield for over 150 years. They are proud of their local, village heritage. The band will play a repertoire of well-known classics along with some festive favourites. The show will end with some carols for you to sing along with. Rony Robinson and Paulette Edwards are much-loved local radio personalities who can be heard daily on BBC Radio Sheffield. They will host the evening offering personal reminisces and seasonal readings to accompany the music. This will be a special evening to celebrate the festive season with family and friends. The hall will be trimmed-up for the season and seasonal drinks and food will be available. 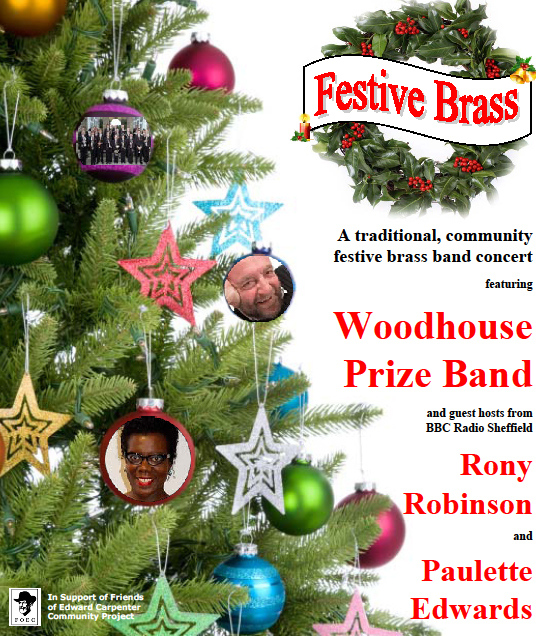 Make a date to join us for a wonderful evening of Festive Brass and seasonal reflections in the company of Woodhouse Prize Band and Rony and Paulette. All proceeds in aid of Friends of Edward Carpenter (FOEC) - a local community group aiming to establish a fitting memorial to this local, historical social campaigner, writer and poet. Add each type of ticket in order and your shopping cart will be updated. Note: if you do not select to have your tickets posted, they will be available on the door.